Agriculture census finds that llamas are disappearing. What happened? “Once the industry got beyond the novelty and breeding aspects, the question became: what do you do with them?” one expert said. The llama population in the United States appears to be disappearing, as an agriculture census released last week found that the pack animals' numbers in the country have decreased dramatically. 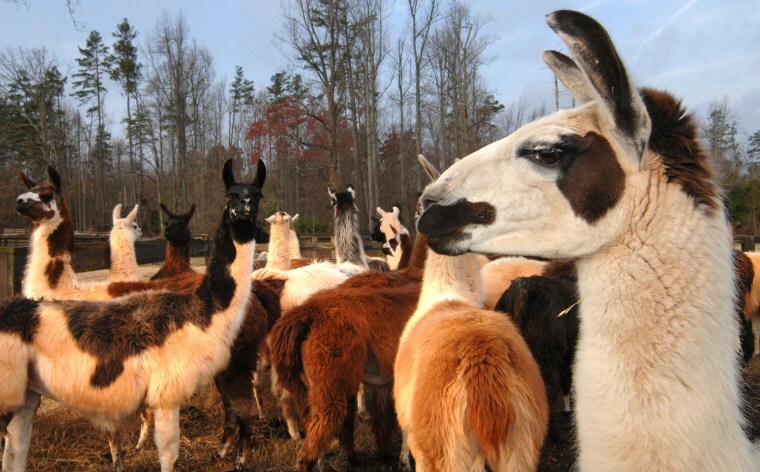 There were nearly 145,000 llamas in the United States in 2002. By 2017, however, there were fewer than 40,000, according to the 2017 Census of Agriculture, which the U.S. Department of Agriculture publishes every five years. The decline likely came as the llama market — once an industry that included high-rolling celebrities and athletes — quietly crashed, llama farmers, auctioneers and experts told NBC News. "You used to go to the major sales and shows, and people would come in these Class A motorhomes. These people owned manufacturing plants, their own jet planes, whatever," said Mark Smith, who has farmed llama in Indiana for 25 years. "They were driving the market when llamas were a good investment." But these pack animals native to South America seemed to only become valuable because people believed they were valuable. Their functional uses include providing fiber or working as pack animals. Llamas also sometimes guard sheep herds. None of those are particularly lucrative uses, however. “Once the industry got beyond the novelty and breeding aspects, the question became: what do you do with them?” said Robert Van Saun, a professor of veterinary science at Penn State University who is an expert on llamas and alpacas. Where did all the llamas go? Llama prices skyrocketed through from the 1980s into the 2000s. Darrell Anderson, an auctioneer at one of the first production sales of llama held in the United States back in 1986 in Salem, Oregon, helped sell a llama that went for a record price of $220,000. The prices, he said, became unsustainable. The llama financial bubble burst slightly after the real estate market crashed in 2007, as people no longer had expendable income to feed this speculative industry. Without an economy around breeding and without a huge market for their meat or their fiber, llamas essentially became the equivalent of Bitcoin or Beanie Babies. “It got to be an investment market and we lost a lot of the common folk,” Anderson said. "It was nice at the time for the folks who were selling but it got to be more restrictive." That led farms to consolidate and many left the llama game entirely. As the dollars dried up, so did the llama herds. Justin Timm's family got into llamas in the 1980s, and he bought his first animal at age 13 in the 1990s. He's watched the industry fluctuate for years, as both a farmer and auctioneer on the West Coast. "It went from a time where literally nearly every female was being bred on a yearly basis to maybe 20 percent of the animals being bred on a bi-annual basis," said Timm, runs online llama auctions. He explained that the animals likely began disappearing naturally because, as people stopped breeding, the older animals died off. But there may also have been an environmental reason. Van Saun noted that llama herds faced increasing risk of parasites as winters become warmer due to climate change — a problem that has also resulted in major losses for goat and sheep producers. The return of the llama? Despite the difficult times, many seem to believe the industry is beginning to pick up again and prices are growing for llamas, especially among breeders. Smith, the Indiana llama farmer, recently sold a premium llama for $20,000 — which is one of the highest prices anyone has fetched for one animal in recent years. "The market is coming back," Smith said. The quality of the llamas that breeders have in the United States is as good as they have ever been — but it’s not what it was back in the 80s or 90s." Llama auctioneers and farmers both said that while the 2017 USDA census saw a low population of llamas, that has only been good for llama farms to get back on their feet. Farmers and breeders said that the low llama population has helped prices grow steadily for the past few years, but it's still a relatively affordable industry that almost anyone can participate in. Jiachuan Wu and Joe Murphy contributed.